Anna-Marie McLemore is a finalist for the 2016 William C. Morris YA Debut Award, which was presented at the ALA Midwinter Youth Media Awards. A full announcement of all of the titles and authors honored at the 2016 YMA’s can be found here. 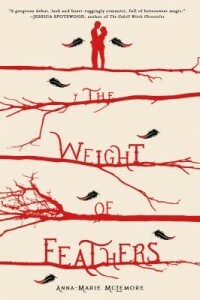 The Weight of Feathers, follows two young people struggling to define themselves and their place in the larger world, and within their own families. Cluck Corbeau belongs to a family of former tightrope walkers, who now perform in a traveling act that scales the tallest trees, while Lace Paloma is the youngest performer in her family’s long-running mermaid show. When the two families set up in the same town, the long-simmering feud between them threatens to boil over, even as Lace and Cluck are drawn closer together. 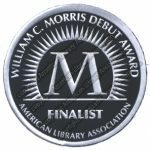 Congratulations on your beautiful first novel, The Weight of Feathers, and on being selected as a Finalist for the William C. Morris Award for debut authors! Thank you so much! I’m so honored to be among these women and their books I so deeply admire, and I’m so grateful to the Morris Committee. I’m thrilled I got to meet both authors and committee members at Midwinter! The novel follows two families with very distinctly and richly-observed cultural heritages, while also exploring the developing individuality of the two main protagonists within and, in some instances, in direct opposition to, those families. Can you speak a little about this tension between belonging and standing apart? Speaking from my own experience, when you grow up in a big, closely knit family, they’re your world. Especially when you share a culture that might be underrepresented or marginalized where you live. The upside of that is the sense of community. But—and this can be good or it can detrimental—what they believe about you is often what you believe about yourself. Cluck thinks he deserves to be shunned because it’s what almost everyone around him believes. Lace accepts that her body should be different than it is because she and her cousins measure themselves by their older relatives’ opinions. The things our families teach us may not be what we believe throughout our lives, but they stay with us even as we define who we are. If we can, we hold onto our heritage, the things we want to go with us, while leaving behind what weighs us down. I’ve read that you met with a Romani scholar to help research Cluck’s family and background; how did you approach researching and writing about a cultural heritage beyond the ones you have been personally immersed in? My personal reasons for wanting to write Romani characters is a long story for another time, but part of why I thought it was important is because there are so many misconceptions about Romani people, especially in this country. 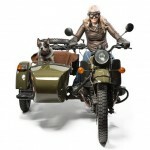 Many people don’t know that the word “gypsy” is a slur; it doesn’t mean someone who likes to travel. Even fewer seem to realize that “gypped” is a slur too. And many people don’t know the history of persecution Romani people have faced. I don’t have Romani heritage, so making sure I was being as respectful and accurate as I could meant doing my research, including talking with an authority from the community. My hope is that I learned not only enough to write a Romani family, but enough to be an ally. Though I’m not Romani, as a Latina, I do know how much it hurts to have my heritage appropriated, to have the story of my culture warped, so I want to be an ally in preventing that in any way I can. One of the most important things I learned from the scholar I talked with is that there’s so often more cultural overlap than we think. I was surprised to learn how much Romani tradition has in common with my heritage. Those moments helped fuel this story. They helped me find its heart and its truth. I loved getting to know an intergenerational cast of characters, and seeing the impact of revered older family members on our young protagonists – did you know from the outset that this would be a YA novel? I’ve been a longtime fan of YA, but I didn’t specifically set out to write a YA novel. But I’m not surprised the book turned out to be one. Part of me will always be seventeen; so many of the decisions I made that defined my life I made when I was a teen. One of my very favorite elements of The Weight of Feathers was the behind-the-scenes perspective on some really unique and mesmerizing performance arts; I especially loved the embedded, site-specific nature of each family’s performances, which took the fantasy of live theater beyond a proscenium stage setting and placed it firmly in natural environments which held their own significance and history for each family and for the story. What sort of research and personal experiences did you draw on to inform these other-worldly performances and their various components? I spent a lot of my teen years in theaters—sometimes acting, sometimes dancing, sometimes working behind the scenes. And getting to carry that sense of performance into the landscapes I’d fallen in love with growing up was one of my favorite parts of writing this story. But I knew I’d need help portraying character performers—actors who stay in character while interacting with the audience—so I consulted with a seasoned performer who both swims as a mermaid and plays characters on land. She’s a pro at inhabiting a persona. She’s even invented her own dialect of mermish! That idea of falling completely into a character is as essential to that sense of magic as any costume. 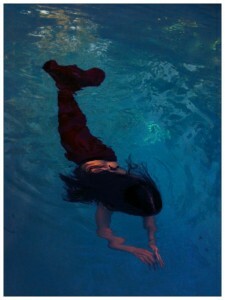 I’ve heard you have your own mermaid tale, can you share with our readers a little about it? 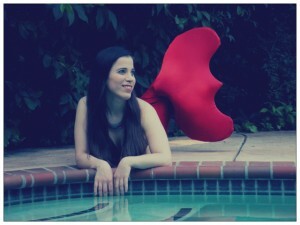 I’ve pretty much wanted to be a mermaid since I was three, so I love wearing my tail whenever I can! How about I show it to you? Can you tell us what you’re working on these days? My next book, WHEN THE MOON WAS OURS, is slated for this fall; I’m thrilled to keep working with the wonderful team at Thomas Dunne Books/St. Martin’s Press! MOON follows new characters through a story that, like TWOF, has multicultural elements and magical realism, but also has central LGBT themes—a transgender boy, the girl who’s been his best friend for more than a decade, and both of them deciding how they want to define themselves. And finally, what were your own favorite books when you were a teenager, and what are you reading these days? Three of the books that made me a reader: Nella Larsen’s Passing, Laura Esquivel’s Like Water for Chocolate, and Antoine de Saint-Exupéry’s The Little Prince. 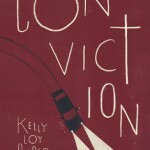 As for what I’m reading these days, I’m so excited about the books that came home with me from ALA Midwinter! I feel so lucky to get an early read of some of the 2016 books I’ve been looking forward to! Thank you so much for your time, and for the magical emotional journey of The Weight of Feathers! We at The Hub are so excited to read When the Moon Was Ours later this year! Thank you so much for your kind words, and for having me on The Hub! Previous Post What Would Carl from the Walking Dead Read?